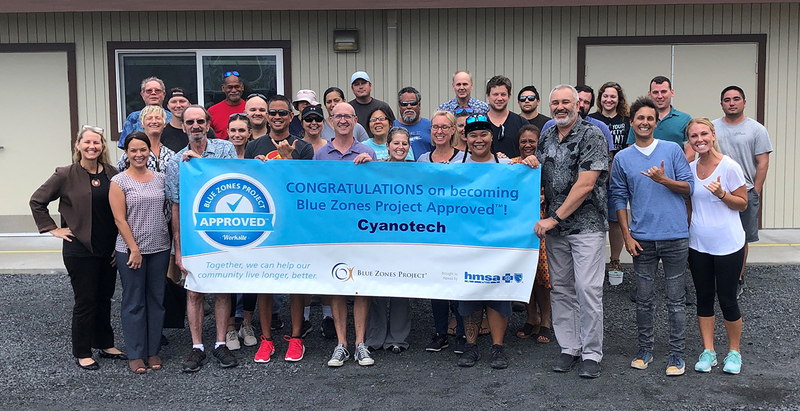 KAILUA-KONA, HAWAII (April 3, 2019) — Cyanotech Corporation, (Nasdaq Capital Market: CYAN), a world leader in microalgae-based, high-value nutrition and health products, is proud to announce that it has joined the Blue Zones Project ‘Ohana (Family). Blue Zones is a well-being improvement initiative that aims to adopt the lifestyle principles of inspiring people to live longer, more active lifestyles – in all the places people live, work, learn and play. Established in 2010, Blue Zones Project is inspired by Dan Buettner, a National Geographic Fellow and New York Times best-selling author who identified five regions of the world—or Blue Zones—with the highest concentration of people living to 100 years or older. Blue Zones Project incorporates Buettner’s findings and works with cities to implement policies and programs that will move a community toward optimal health and well-being. “Our commitment to better health extends to caring for our community and our Island. We cultivate sustainable and natural microalgae, free of herbicides, pesticides and industrial pollutants. Our products, BioAstin® Hawaiian Astaxanthin® and Hawaiian Spirulina®, have proven life-long health benefits that help people enjoy more active and healthier lives,” added Morton. Currently, 42 communities in nine states have joined Blue Zones Project, impacting more than 3.3 million Americans nationwide. Cyanotech joins over 35 registered and 19 certified work sites in West Hawaii County who believe in helping their employees be healthier at work. All Cyanotech products are produced from microalgae grown at our 90-acre facility in Kona, Hawaii using patented and proprietary technology and are Generally Recognized as Safe (GRAS) for use in food products. Cyanotech sells its products direct to consumers at retail locations in the United States and online at www.nutrex-hawaii.com and also distributes to dietary supplement, nutraceutical and cosmeceutical manufacturers and marketers. The Company is regulated by the FDA. Visit www.cyanotech.com for more information.